In the beginning, Ryan Lochte swam at Michael Phelps’s hip and drafted off his fame. He signed with the same sports agency and the same swimwear company, and he smiled like a rakish groomsman after Phelps beat him at the 2008 Olympics in the 200- and 400-meter individual medleys. From his perch on the deck in Beijing, Lochte observed Phelps racing as if wearing blinders on his way to a record eight gold medals, and Lochte’s mirth hardened into mettle. He realized it was not physical or mental strength that separated them; it was strength of purpose. If Lochte was going to move out of Phelps’s slipstream, he would have to train smarter, eat healthier, lift more. He added strongman exercises to his dryland routine, grilled chicken breasts to his diet and two marketing mavericks to his inner circle. Out went greasy foods, sugary beverages and the Octagon representation that he shared with Phelps. In the lead-up to the 2012 Olympics, Lochte, who turns 28 on Aug. 3, has been more focused at the pool, if no less flighty away from it. He has retained the skateboard, the sketchpad, the rococo wardrobe and the appetite for high jinks that call to mind a character in a Judd Apatow movie. His grand plan, executed so far without a glitch, is to roll out a more user-friendly version of Phelps in London. Phelps could have retired to the golf links after Beijing. But as he demonstrated at the United States Olympic trials, he is not ready for obsolescence. After a few fits and starts, Phelps, 27, became a more streamlined version of the multifaceted machine that remade the sport in 2008, qualifying for an eight-event program in London that he has since reduced to seven. He and Lochte will go head-to-head in both individual medleys and team up in at least one relay. Phelps versus Lochte is the sport’s version of a perfect wave: two fierce competitors, one with the winningest portfolio and the other with a winsome personality, fighting a turf war with the world bearing witness. Theirs is not a match manufactured for ratings, even though NBC has played it up in its coverage; it is an organic rivalry that is raising interest in their sport. The United States Olympic trials, held in Omaha for eight days beginning in late June, attracted journalists from as far afield as Australia, France, Germany, Britain, the Netherlands and Japan. On the day that Lochte and Phelps squared off twice, a scalper was selling tickets outside the arena. Two weeks later, at a pre-Olympics training camp in Knoxville, Tenn., fans began lining up at 4 a.m. to watch the team’s 8 a.m. practice. By 7:30, an estimated 2,000 people were waiting in the rain to get inside the University of Tennessee’s 1,200-seat facility. The mixed zone is where the paths of journalists and swimmers intersect, and after the heats of the men’s 400-meter individual medley on the first morning of the trials, the zone was flooded by reporters eager to speak to the main combatants. Phelps stopped, but not long enough to leave a puddle. Lochte stood and answered questions until Gregg Troy, his coach for the past decade, swooped in and dragged him by the arm to the warm-down pool. Phelps turned professional at 16 after competing in the 2000 Olympics. While he has taken college classes, Phelps missed out on the camaraderie and team-building at the core of collegiate competition. In terms of personality, Lochte is Magic Johnson to Phelps’s Larry Bird. The third of five children, Lochte acts like a big brother to everyone, including his two older sisters. He swam collegiately at Florida and craves human connection as much as high-level competition. Less than two hours after Troy pulled him away from a crowd of journalists at the trials, Lochte resurfaced in another. On his way out of the arena, Lochte stopped by an area set aside for fans to test their swimming skills, behold the latest training gadgetry and buy merchandise. Wandering amid the public, Lochte spent several minutes posing for photographs and signing autographs. A few hours later he beat Phelps, the reigning Olympic champion, in the final of the 400 I.M. for his only victory in their four head-to-head races at the trials. Troy was not aware of Lochte’s morning detour until much later but said he doubted he could have done much to stop it. “If you do anything other than allow him to be himself, he’s not going to be the same athlete,” Troy said. Matt Biondi, an 11-time Olympic medalist, can appreciate where both stars are coming from. He has spent more time around Lochte, his most recent encounter occurring at the trials when Biondi and his two sons, ages 13 and 9, ran into Lochte as he was finishing another impromptu signing session. As a swimmer, Biondi said, it frustrated him when he was asked for “one more” autograph because it invariably led to engaging with strangers for several more minutes. As a parent, though, Biondi knew how much it would mean to his boys to interact with Lochte, however briefly. He asked if Lochte had time for two more autographs, and, of course, he did. Erika Wright, a lawyer who has teamed with Shawn Zenga to market Lochte, is married to Johnny Wright, a longtime music manager who has worked with the Backstreet Boys, Britney Spears and ’N Sync. Lochte, she said, has the same ineffable qualities that made Justin Timberlake a star. 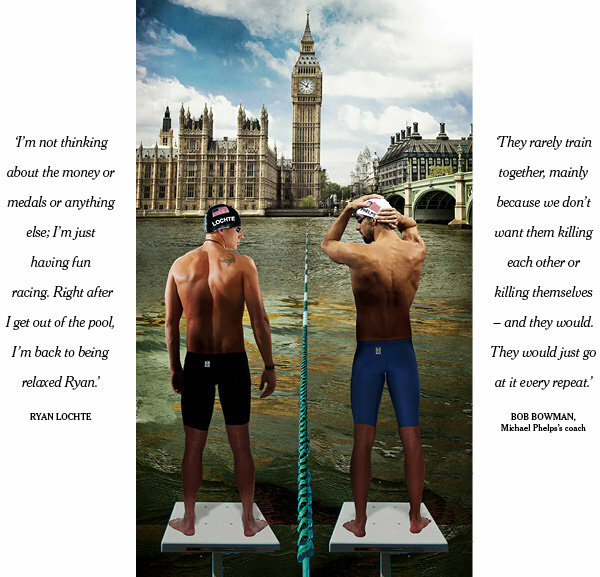 Lochte and Phelps get along, their friendship largely kept afloat by an affinity for rap music and their partnership, during team trips, in nightly games of spades against Ricky Berens and Cullen Jones. Nobody can recall how Phelps and Lochte came to be paired together, but the arrangement probably has preserved the card group. If they had been opponents, it is easy to imagine the first hand ending with the loser, be it Lochte or Phelps, upending the hotel-room table and flinging the cards away. They are so competitive that they have to be separated in practices. It is a healthy competition, Phelps said. Phelps versus Lochte is not swimming’s first marquee rivalry. In the 1980s, Biondi and his fellow American Tom Jager waged a fierce battle in the 50 freestyle. In 1990, they accounted for 9 of the 10 fastest times recorded in the long-course version of the event. In 1990, Biondi and Jager started a series of races designed to publicize the sport called the Dash for Cash. The winner pocketed $10,000 here or $12,000 there, a pittance next to the million-dollar endorsement deals signed by Phelps and Lochte with companies like Speedo, Visa and Gillette. But it was an important first step on the road to financial security for the sport’s top American performers. “I don’t think that Ryan or Michael has any idea of what it was like for us pushing the envelope,” Biondi said. In 2008, Lochte pushed Phelps to a world record in the 400 I.M. at the United States Olympic trials; his runner-up time was also under the existing mark. Physically, Lochte was ready for his close-up in Beijing, but his focus kept fading in and out. A long-term relationship with a member of the American swim team ended around the time of the Games. Thrown out of kilter by his whipsawing emotions and also by a stomach ailment he developed in China, Lochte finished third in both individual medleys. “Things that were happening away from the pool were affecting him in it,” Troy said. Lochte still managed to set his career on a new course at those Games with an upset of the defending Olympic champion Aaron Peirsol in the 200 backstroke. Troy said the victory, which gave Lochte his first individual gold, was the catalyst for the success that has followed. Since 2008, Lochte has beaten Phelps head-to-head in the 200 and 400 I.M. and the 200-meter freestyle. After catching and passing Mark Spitz’s single Games gold-medal record, Phelps experienced a letdown that lasted the better part of three years. Lochte’s five gold medals at the 2011 world championships provided the splash of cold water that Phelps needed to wake up. He stopped short of saying he was one of them. “I was trying to do my own thing in 2008, so I’m doing my same thing now,” he said. After Phelps registered three defeats last year in his best event, the 200-meter butterfly, Spitz cautioned against counting him out. Lochte has made it plain that he did not change his diet, step up his dryland workouts and stay in Gainesville, Fla., to train despite feeling increasingly hemmed in by the college environment just to finish second at the Olympics.